Driving out in the Australian desert you may come across a bright orange two-foot long lizard perched on a tree stump. It will be a bearded dragon, surveying its territory. But if you stop and get out of your car, it will transform into a dull colour and try to escape notice using his new camouflage. But just how well can bearded dragons blend into their environment? And is this ability driven by evolutionary adaption, or are they responding to what they see around them? The answer is a bit of both. Biologists have found that lizards adapted to the red sands of central Australia can’t blend in with the yellow sands of the south as well as the local lizards. At the same time, the southerners can’t match the red hues of their central Australian cousins. But in research published in the Journal of Experimental Biology, they also found that the lizards did nevertheless change colour to try to camouflage themselves as best they could. It suggests that while evolution is important, the lizards change their colour in response to the different conditions they see around them. “It is very handy for bearded dragons that they can change their skin colour. They can become flashy orange with jet-black beards to warn rivals off their territory, become camouflaged to hide from predators, and darken themselves to absorb more heat from the sun,” says Associate Professor Devi Stuart-Fox of the University of Melbourne’s School of BioSciences, who is part of a team biologists undertaking a broader study of how and why bearded dragons change colour. “The fact that they can respond to their environment in the short term by changing their appearance is very interesting, both for understanding why they do it but also how they do it,” she says. Reptiles change skin colour by altering the distribution of natural pigments like melanin inside their skin cells. In some cases reptiles can also change the distribution of crystal formations inside their cells, to change the way light reflects off their skin. 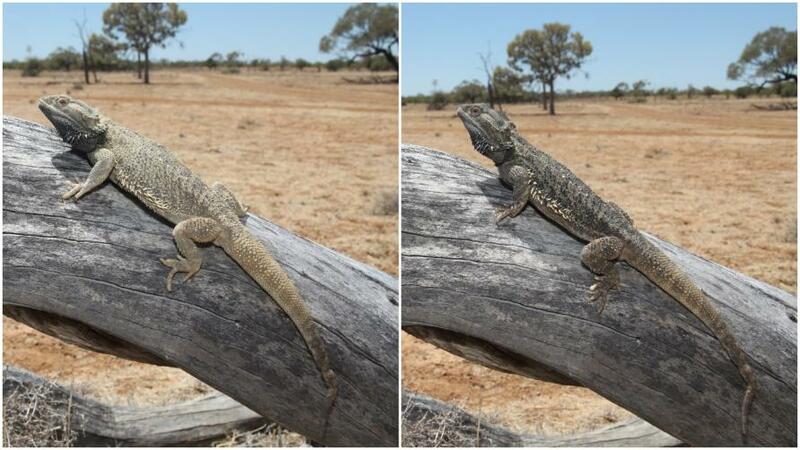 To assess how well bearded dragons can adapt to different environments the team went hunting for lizards in Alice Springs in central Australia and in the Mallee region of Victoria, near Mildura in the country’s south. According to Associate Professor Stuart-Fox, the lizards aren’t too hard to catch. While they are quick, their reliance on camouflage means they are prone to stopping and staying still in the hope they’ll go unnoticed. As a last resort they will puff themselves up and open their jaws, but it is mostly just for show. “Bearded dragons make a big show of looking scary but once you know that, you can just pick them up from the back of their head so they can’t bite you,” she says. They chose males because males often make themselves conspicuous as they patrol their territories, so they might benefit most from colour change. Once back in Melbourne, the 22 lizards, 11 from Alice Springs and 11 from Mildura, were allowed to adjust to captivity for three months before the researchers experimented with how they could change colour against different backgrounds – red sand, yellow sand, and a black sand background that none of them would be accustomed to. The lizards were left alone for 45 minutes in a special enclosure and their colour changes were monitored using time-lapse photography. Researchers found there was little difference in how much the lizards could change colour, but the range of colours they could produce was linked to their different habitats. They found the Mildura lizards were able to more closely resemble the yellow sands that predominate in the region, while the Alice Springs lizards were better able to match the colour of their native red sands. Interestingly, while black sand was foreign to both populations, the Mildura lizards were better at matching it. The researchers speculate that this may be because there is more vegetation in region, providing more opportunity for lizards to match themselves against dark brown and grey branches and tree trunks. It seems there is no beating natural selection. Professor Stuart-Fox’s co-authors include lead author Viviana Cadena, honorary research fellow at Melbourne University’s School of BioSciences, Kathleen R. Smith, also from the School of BioSciences, and John A. Endler from Deakin University’s School of Life and Environmental Sciences. The Native Australian Animals Trust supports the University of Melbourne’s work to understand and conserve Australia’s unique wildlife and environments.